Overly dry nails are a common ailment that often become the underlying cause of related problems like nail breakages and splitting. This issue can affect women of all ages, but nail problems are particularly common for menopausal and postmenopausal women, likely due to the effects of hormone changes on calcium. However, symptoms of dry nails can be alleviated fairly easily using creams and oils. Keep reading to learn which creams and oils can soothe your dry nails. While it is possible to buy a special nail cream, you can save money by instead using these items that you probably already have in your house. Any type of cream or lotion meant to moisturize skin can do the trick for nails as well, and you won't need to spend money on a new, expensive product. Heavy creams that stay in place work best, and they should be applied to the nails after showering and thoroughly rubbed in. One of the best oils for dry nails, coconut oil is known for its highly moisturizing property, and this property is equally useful for nails as for skin. It should be massaged into dry or brittle nails for approximately one minute for the best results. Another common kitchen ingredient that can help with relieving symptoms of dry nails is olive oil. It can be massaged into your nails like coconut oil, or you can soak your hands in an olive oil-filled bowl for 10 minutes. Like moisturizing cream and coconut oil, olive oil will moisturize nails, but it can also help nails absorb more calcium, which helps the nail gain strength and health as well. 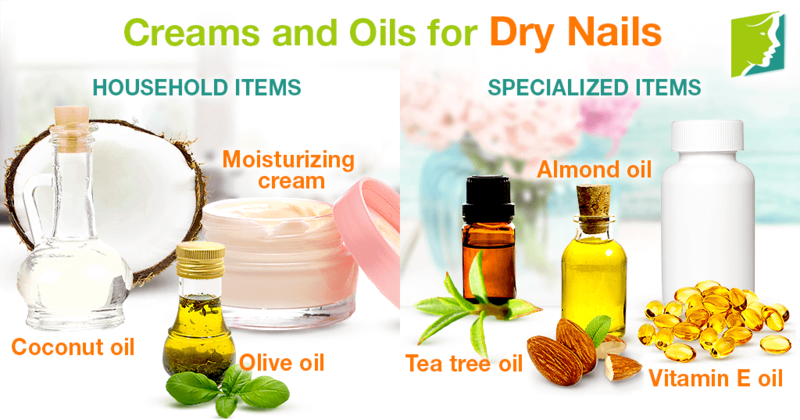 Some oils that can help relieve dry nails are less common and may not be items you already have. These can be purchased specifically for improving nail health. This is another moisturizing oil, but its vitamin content can also help to nourish and strengthen the nail, reducing the likelihood of breakages or splitting. Vitamin E is often sold in capsules, which can be taken orally or can be split open and the oil massaged into the nails and nail beds. Tea tree oil can be mixed with vitamin E when applied to the nails. Tea tree oil is a powerful antiseptic, which can be useful if any infections have begun to attack your weakened nails. It can also aid in general nail health and prevent discoloration of the nails. It is a moisturizing oil that can be incredibly useful for moisturizing dry nails, and it also contains antioxidants along with several important nutrients that can help to build up nail strength and health. This can help prevent the nails from breaking while keeping them healthy. Dealing with dry nails can be annoying and even sometimes painful, but these creams and oils can help to keep the symptoms of dry nails in check. For even more help managing symptoms of dry nails, check out these ways to fix dry nails.